An Appointment in Samarra is W. Somerset Maugham's retelling of an ancient Mesopotamian tale which is about the encounter of death (or the angel of death) and a man from Baghdad. 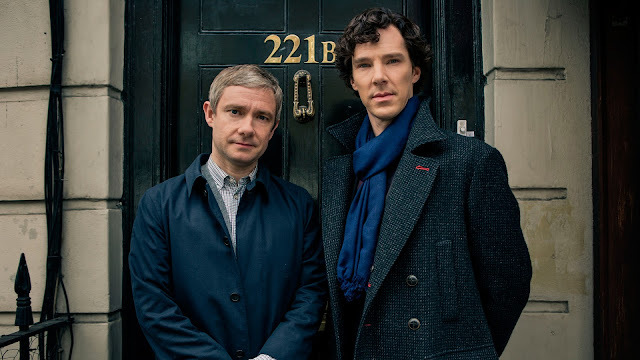 Sherlock makes a reference to the tale in episode 1 of season 4. It immediately caught my attention because my mother told me a similar story when I was young. Naturally, I started digging and found out that the original story is related to Prophet Solomon (or Sulaiman in Arabic) and a reference to it is found in the Babylonian Talmud. A reference to the story is also found in Islamic literature. In all the three versions, however, the place to which the man goes is different; Samarra, the district of Luz, and India respectively in Maugham, Talmud, and Islamic literature's version respectively. The three different versions follow. There was a merchant in Bagdad who sent his servant to market to buy provisions and in a little while the servant came back, white and trembling, and said, Master, just now when I was in the marketplace I was jostled by a woman in the crowd and when I turned I saw it was Death that jostled me. She looked at me and made a threatening gesture, now, lend me your horse, and I will ride away from this city and avoid my fate. I will go to Samarra and there Death will not find me. The merchant lent him his horse, and the servant mounted it, and he dug his spurs in its flanks and as fast as the horse could gallop he went. Then the merchant went down to the marketplace and he saw me standing in the crowd and he came to me and said, why did you make a threatening gesture to my servant when you saw him this morning? That was not a threatening gesture, I said, it was only a start of surprise. I was astonished to see him in Bagdad, for I had an appointment with him tonight in Samarra. R. Johanan stated, A man's feet are responsible for him; they lead him to the place where he is wanted. There were once two Cushites who attended on Solomon, and these were Elihoreph and Ahyah, the sons of Shisha, scribes, of Solomon. One day Solomon observed that the Angel of Death was sad. ‘Why’, he said to him, ‘art thou sad?’ — ‘Because’, he answered him, ‘they have demanded from me the two Cushites who sit here’. [Solomon thereupon] gave them in charge of the spirits and sent them to the district of Luz. When, however, they reached the district of Luz they died. On the following day, he observed that the Angel of Death was in cheerful spirits. ‘Why’, he said to him, ‘art thou cheerful?’ — ‘To the place’, the other replied, ‘where they expected them from me, thither didst thou send them!’ Solomon thereupon uttered the saying, ‘A man's feet are responsible for him; they lead him to the place where he is wanted’. Abū ‘l-Shaykh from Dā’ūd ibn Abī Hind; he said: It reached me that the Angel of Death was made responsible for Solomon (peace be upon him), and he was told: ‘Go into his presence every day, and ask what he needs; then do not leave him until you have performed it.’ He used to enter upon him in the image of a man, and he would ask him how he was. Then he would say: ‘Messenger of God, do you need anything?’ If he said: ‘Yes’, then he did not leave him until he had done it; and if he said: ‘No’, then he left him until the following morning. One day he entered upon him while there was an old man with him. [Solomon] stood up, and greeted [him], then [the Angel of Death] said: ‘Do you need anything, Messenger of God?’ He said: ‘No.’ The [angel] glanced at [the old man] and the old man trembled; the Angel of Death left and the old man stood up and said to Solomon: ‘I beg you, by the truth of God! to command the wind to carry me and throw me down on the furthest lump of mud in the land of India (hind)!’ So [Solomon] commanded it and it carried him [there].